Along with working in an outpatient family medicine office, I typically work a couple of evenings in our rural town’s local urgent care.In this clinic, I see a myriad of complaints and diagnoses. Anything from allergies, strep throat, URI, UTI, cellulitis, and cough to gastroenteritis or appendicitis. A key thing in any setting like this is to know your bounds. Know what type of care you can provide in your facility and when a patient is higher acuity and needs emergent services that cannot be provided at your location. Two cases clearly come to mind in which these patients had the same diagnosis. However, their treatments were vastly different. The first was a 31-year-old who had a cough and congestion for the last two weeks. Vitals showed normal blood pressure, respiration rate, and pulse, but a temperature of 102 degrees. Pulse oxygenation was 95%. 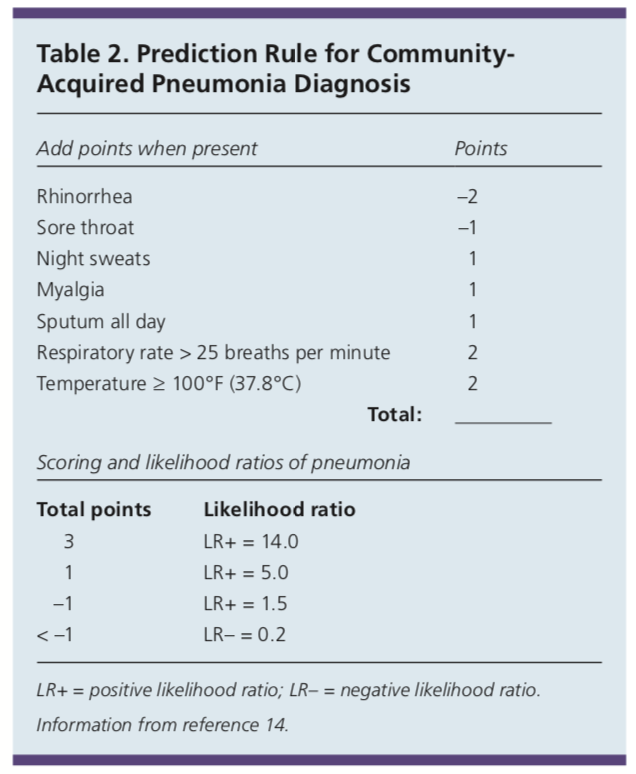 Further investigation on physical exam revealed rhonchi, with positive bronchophony, egophony, and tactile fremitus. Otherwise, the patient was healthy, except for a history of smoking. The second patient was a 67-year-old who had a productive cough for three days with a fever of 103.4 degrees, respiratory rate of 32 respirations per minute, and pulse of 102. Pulse oxygenation was 88 percent at rest. Examination revealed diffuse right-sided lung field wheezing with rhonchi and positive whispered pectoriloquy, bronchophony, egophony, and tactile fremitus. This patient noted that they were healthy other than a 55-pack year smoking history but had not seen a healthcare provider for many years. Both of these patients were sent to radiology for a chest x-ray. 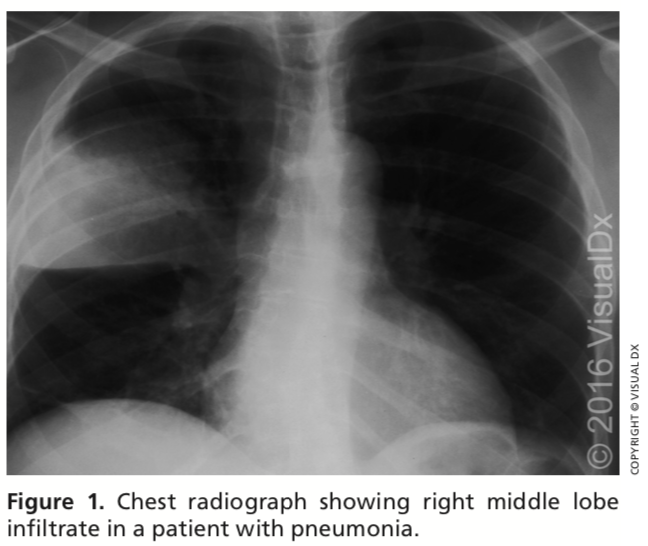 Both of these patients had a lung infiltrate present on imaging and were diagnosed with pneumonia. The first was able to be treated with outpatient antibiotics. The second, once at radiology had a pulse oxygenation in the 70’s and was sent next door to the ER and subsequently admitted for inpatient care of pneumonia. As you can see, these are two very different endings to a similar diagnosis. A lot of this comes into play in the severity, treatment, and plan of care in patients with pneumonia. 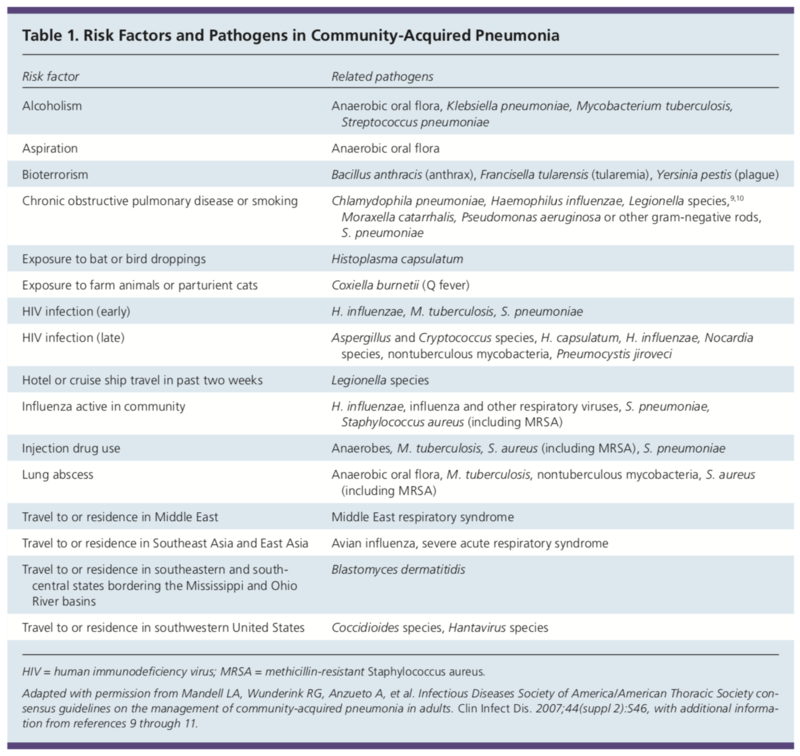 Today we will discuss the topic of community-acquired pneumonia (CAP) including the diagnosis and treatment. In the U.S. the yearly health care costs related to pneumonia varies between 10.6 to 17 billion dollars, and this number is expected to increase as our population ages. Ninety percent of this cost is due to pneumonia cases that are required to have inpatient hospital care. The most common etiology of CAP is Streptococcus pneumoniae. However, the incidence of other etiologic organisms has risen. An entire clinical picture should be assessed to look for other risk factors that may direct us towards less likely etiologies. 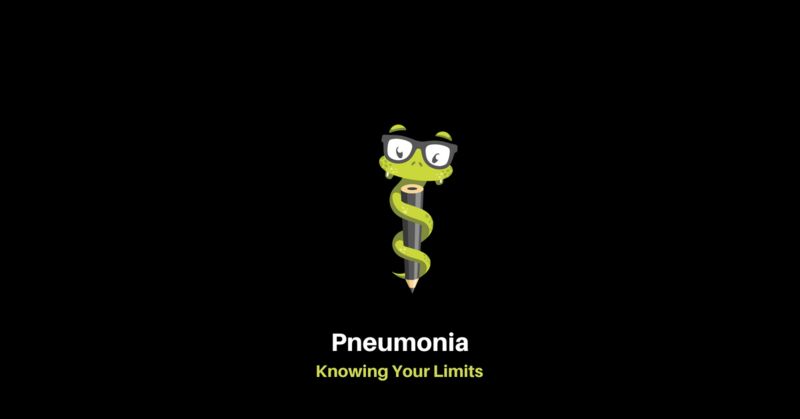 Patients with pneumonia can present with a plethora of symptoms including dyspnea, cough, wheezing, pleuritic chest pain, chills, fatigue, lethargy, or fever. The initial task is to evaluate the severity of the patient and triage their care appropriately. Next, is to complete a thorough history and physical examination. 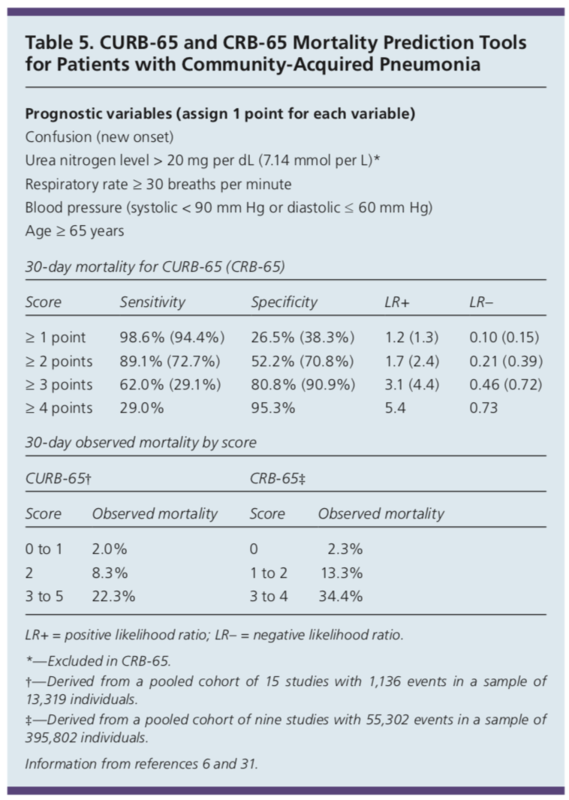 Prediction rules for CAP which look at a patient’s symptoms and physical exam findings can aid in determining how likely the diagnosis may be and help with diagnosis and treatment. In all patients where there is concern of respiratory illness such as pneumonia, pulse oximetry should be completed. 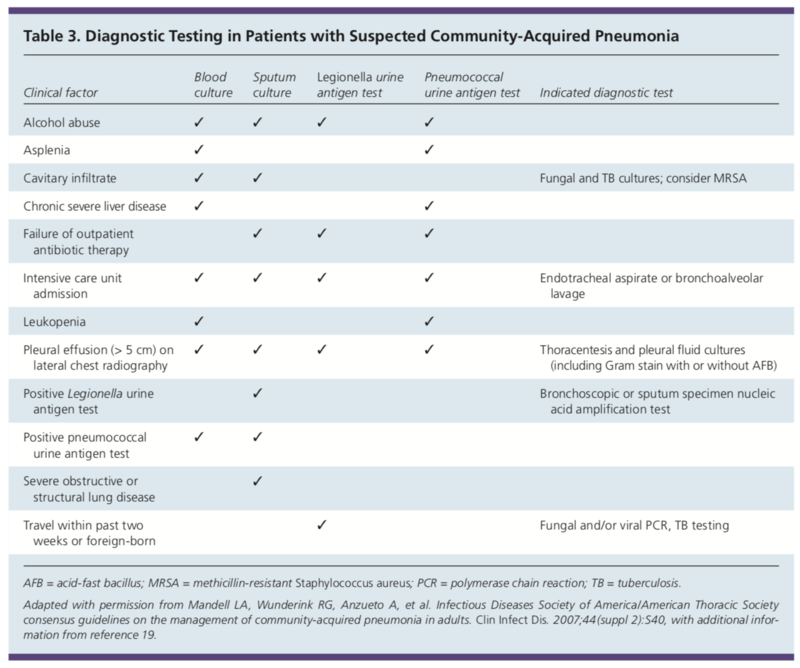 Microbiologic testing is not regularly needed in an outpatient setting, but if there are specific risk factors in which an unlikely etiology might be the cause, and thus change your treatment plan, these testings may be indicated as below. The treatment for CAP differs based on the location of the patient primarily (inpatient vs. outpatient). If a patient is healthy and has not been on any antibiotics in the last three months, they may be treated with Azithromycin or Doxycycline. If a patient has been on antibiotics in the last three months or has other comorbidities including cardiac, pulmonary, kidney, or liver disease, or diabetes, alcoholism, malignancy, immunosuppression, or asplenia, treatment should be with a respiratory fluoroquinolone such as Levaquin, Gemifloxacin, or Moxifloxacin. Alternative options include a beta-lactam such as high dose Amoxicillin, Augmentin, Cefuroxime, or Cefpodoxime plus a macrolide. If the patient is in the hospital, but not in the ICU, the recommended agent is a respiratory fluoroquinolone.Alternative therapy would be a beta-lactam plus a macrolide. If in the ICU, treatment should include ceftriaxone, cefotaxime, or ampicillin/sulbactam plus a macrolide, or plus a macrolide and respiratory fluoroquinolone. If there are concerns about MRSA infection, Vancomycin, Linezolid, of Ceftaroline should be used. If influenza is the underlying cause, the patient should be treated with Oseltamivir or Zanamivir. Remember that these antibiotic recommendations are a general guideline. Appropriate antimicrobial recommendations can fluctuate based on geographic location and microbial resistance patterns in that specific region. If you are practicing medicine or a student, it is always a good idea to contact your hospital pharmacist to acquire this data on local resistance patterns, which can help further guide you on proper antibiotic usage in your local area. Regarding prevention of pneumonia, all patients aged 65 and older should receive the PCV13 and PPSV23.In those patients with diabetes, chronic lung or heart disease, liver disease, cirrhosis, CSF leak, cochlear implant, or smokers should receive the PPSV23 immunization once from 19 to 64 years of age. 1. Am Fam Physician. 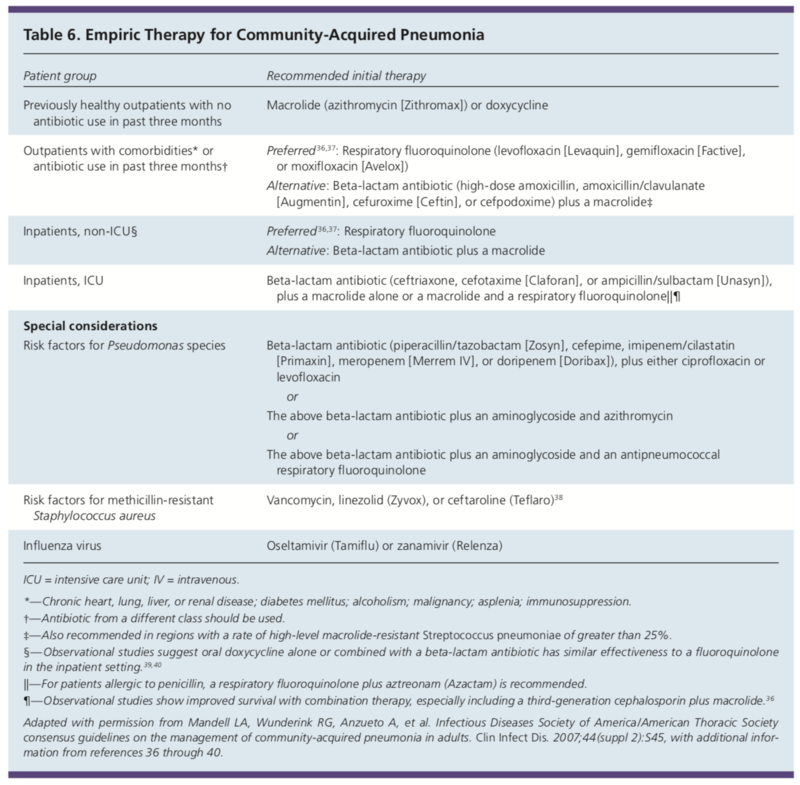 Community-Acquired Pneumonia in Adults: Diagnosis and Management. 2016;94(9):698-706. 2. Ferri’s Clinical Advisor. Pneumonia. 2017. This article, blog, or podcast should not be used in any legal capacity whatsoever, including but not limited to establishing standard of care in a legal sense or as a basis of expert witness testimony.No guarantee is given regarding the accuracy of any statements or opinions made on the podcast or blog. Clay Walker is a board-certified physician assistant practicing in family medicine and urgent care in rural southern Illinois. He is a graduate of Southern Illinois University School of Medicine Physician Assistant Program - class of 2016. Prior to going to PA school, Clay worked as a histology technician in southern Illinois. From an early age, he has been interested in medicine. Clay was diagnosed as a type 1 diabetic in the first grade. He began learning about his condition and teaching others about T1DM; since then, he began to have a passion to learn medicine and make a difference in the lives of others. In his free time, Clay enjoys watching sports and going to sporting events, specifically the Chicago Cubs and Philadelphia Eagles.